Quote of the day: 'This thing can also be smoked with some of your finest, where you at or however you at. You can roll with an expert, you can roll with Snoop.' Rapper-turned-entrepreneur Snoop Dogg has worked out the best way to appeal to his target demographic. He has just brought out a book of his lyrics - made of perforated rolling papers which can be pulled apart and smoked after reading. And the pièce de résistance? A striking surface on the spine to make it even easier for readers to toke up and bliss out. 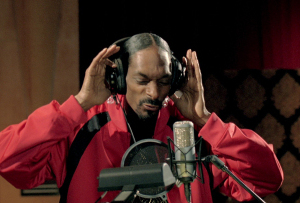 Watch Snoop Dogg's promotional video for the new book here.